Sailors know that the ocean is a vital part of New England’s economic and social fabric. People in this region greatly value our maritime heritage and are seeking basic needs from the ocean – jobs, food, energy, and recreation, among others – in new and increasingly complex ways. At the same time, environmental changes are affecting the health of the ocean and its creatures. A New England-wide effort has been underway since 2012 to tackle these issues under the direction of the National Ocean Policy, established by Presidential Executive Order and building on state efforts, particularly in Massachusetts and Rhode Island. Representatives from the six New England states, federally recognized tribes, federal agencies, and the New England Fishery Management Council have come together to create the Northeast Ocean Plan. The planning effort to date has had two main underpinnings: public engagement and development of peer- and expert-reviewed data and information that describe uses of the ocean as well as species and their habitats. A study by the Northeast Regional Planning Body provides the first publicly available information about the general routes of distance races throughout the region, including those depicted on this map. This past October, a study was completed that characterizes several elements of recreational activity including long distance sailing races, commercial whale watching, SCUBA diving, and board and paddle events. 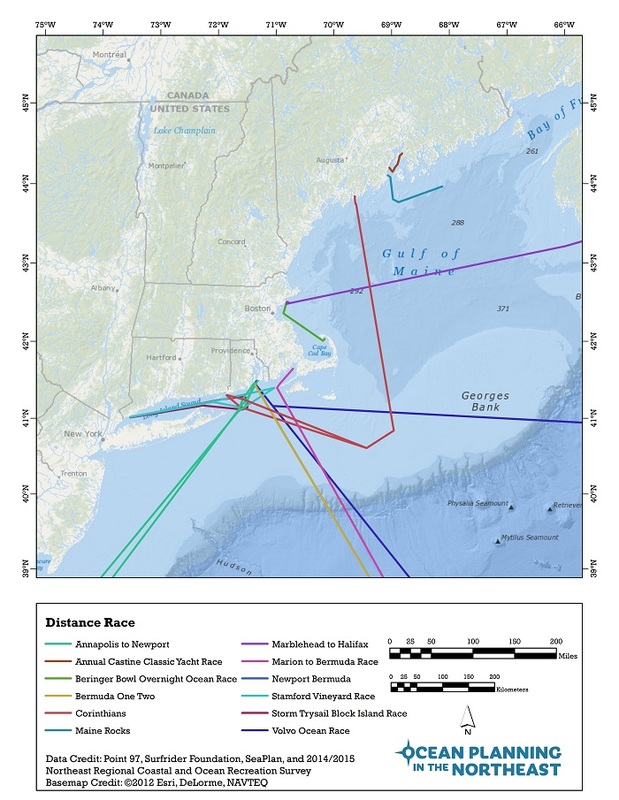 The study also contains a chapter focused on sailing races and regattas throughout the region, depicting the general cruising route for distance races and many high-profile regattas. Results include both a map of 12 distance races along with a table describing their general route and time of year. This information filled a previously identified gap in information – while anecdotally such routes were known by some, this study provides the first publicly available information describing these races. Results are available online through the ocean plan’s online atlas, the Northeast Ocean Data Portal (maps of many other human uses and natural resources are also available). Previous work done as part of the ocean planning effort focused on a recreational boating survey to capture data on boating trips and expenditures. This survey included input from over 10,000 boaters across New England, and results revealed that in 2012, 907,000 boating trips on the ocean generated approximately $3.5 billion and the equivalent of nearly 27,000 year-round jobs in the Northeast region alone. The data collected was also used to generate maps of popular recreational boating locations, which are available through the Northeast Ocean Data Portal. These two projects are examples of the approach taken to develop the Northeast Ocean Plan by combining development of information with public and expert engagement. Similar projects have focused on shipping, fishing, marine life and habitats, and other topics -producing maps developed through extensive public input that show the “footprint” of activities and resources. See the Northeast ocean planning website for more information and additional overviews of the process and results to date. The draft Northeast Ocean Plan will generally include results from these projects and describe how federal agencies will use data and information in their decision-making in the future (for example, related to siting new activities in the ocean). The draft NE Ocean Plan will be released this spring, followed by opportunities to comment and attend a public meeting to learn more. For information on these events, check the Northeast ocean planning website, neoceanplanning.org, in the weeks ahead. It is also important to note that a similar planning effort is now underway in Long Island Sound. Recent passage of “Blue Plan” legislation established a process by which Connecticut will develop an inventory of Long Island Sound’s (LIS) natural resources and uses and, ultimately, a spatial plan to guide the future of the Sound’s waters and submerged lands. Over the next three or four years, there will be many opportunities for LIS enthusiasts to get involved in this local planning effort. Katie Lund and John Weber are members of the ocean planning staff at the Northeast Regional Ocean Council.